One of my goals as a parent is to teach my kids how to use their imaginations. In particular, I want them to be creative problem solvers, you know, kids who think outside the box. I just model different ways of solving a problem or show them how to use objects in novel ways, hoping that one day they will emulate me. For those that do not already know, J is a bit gifted when it comes to the written word. 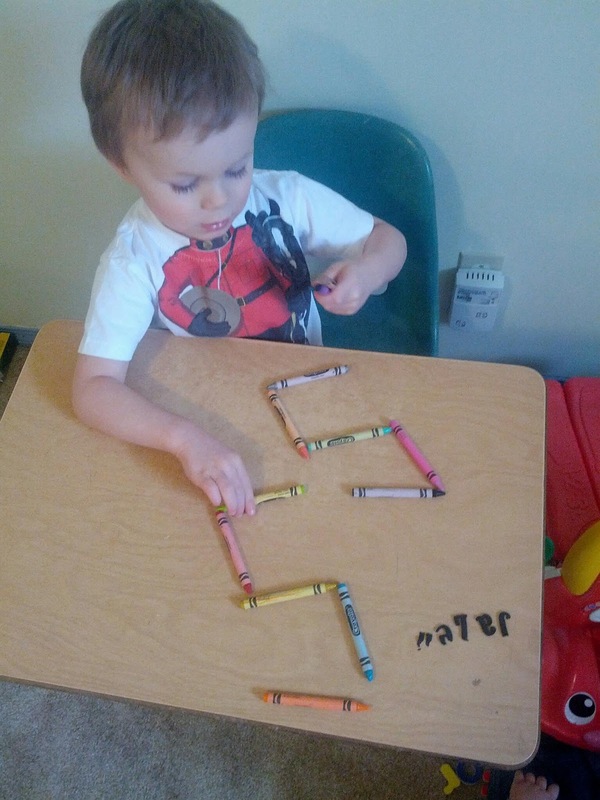 He could name and identify the entire alphabet, upper and lower case, by 20 months. 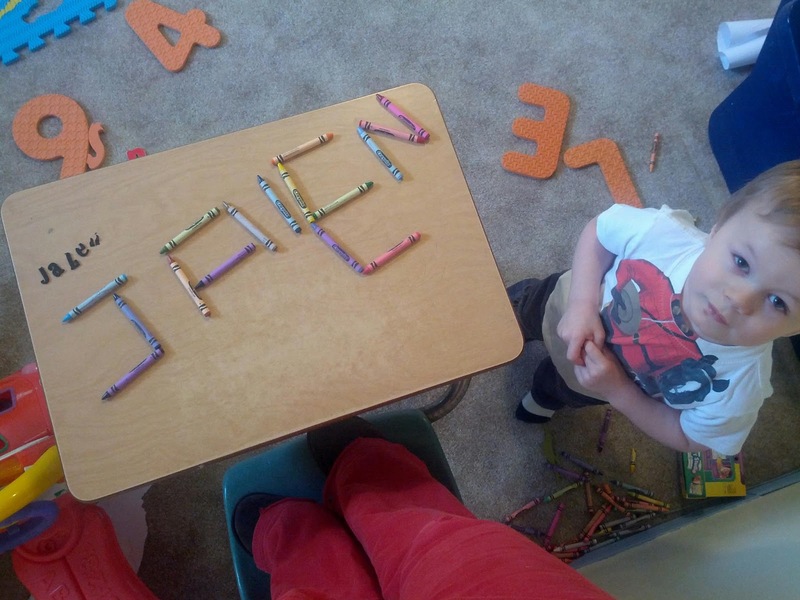 As a result, he began to read, by sight, and spell words correctly before age 2. And I am not talking just a few words. I mean upwards of 50 words and those would be the words that I was aware of. There could have certainly been many more for all I know. 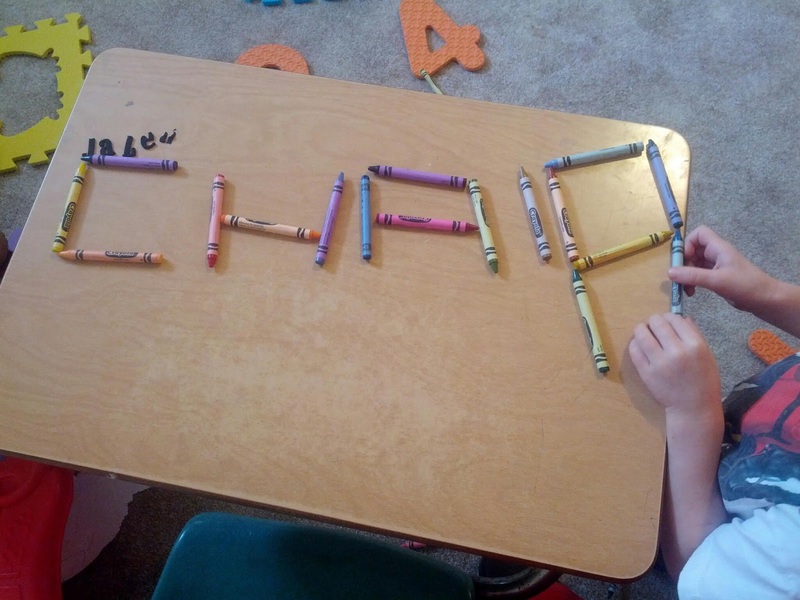 Regardless, the point is that he can spell and read and has been doing so for a year and a half. He never misses an opportunity to read and spell, no matter what medium he may be presented with. I remember him eating banana chips and pointing out how the broken ones looked like the letter C, while the round ones looked like the letter O. Or the time he wrote 'cat' and 'yo-yo' using alphabet stickers. Or when I found the phrase 'my duck' written on the freezer with alphabet magnets, shortly after J and K had been fighting over a duck puppet. You get my point. 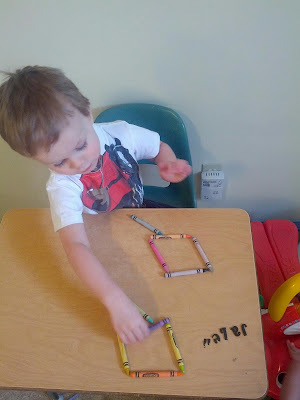 Lately, he has been into forming letters using different objects. We have made letters using rectangle pieces of felt on the felt board, pretzel sticks, glass beads, etc. Yup, that's his name. I love that he uses a lowercase L, uses fewer crayons...haha. And yes, I am wearing sweatpants. I'm a stay-at-home-mom and my yoga pants were dirty. 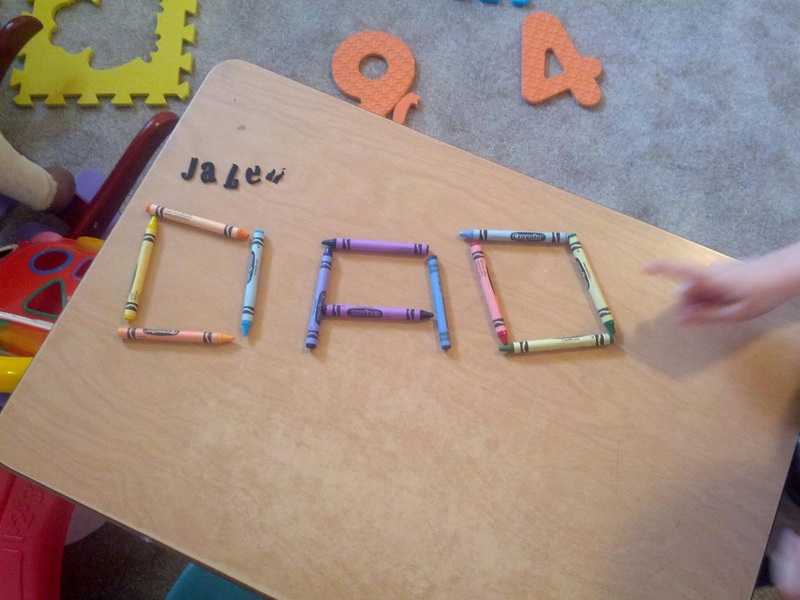 I thought it was funny that he chose to write Dyan instead of Mom, but Dad instead of Josh. He was just looking around the room at this point and I was standing on a chair. Then he saw the rocking horse. Then he decided to practice his alphabet. 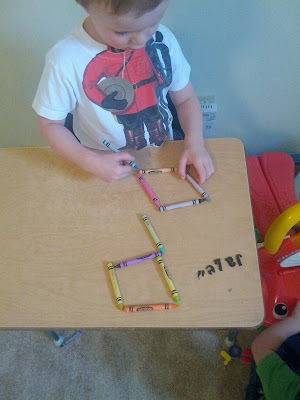 He did one letter at a time, but he made two because two is way better than one! 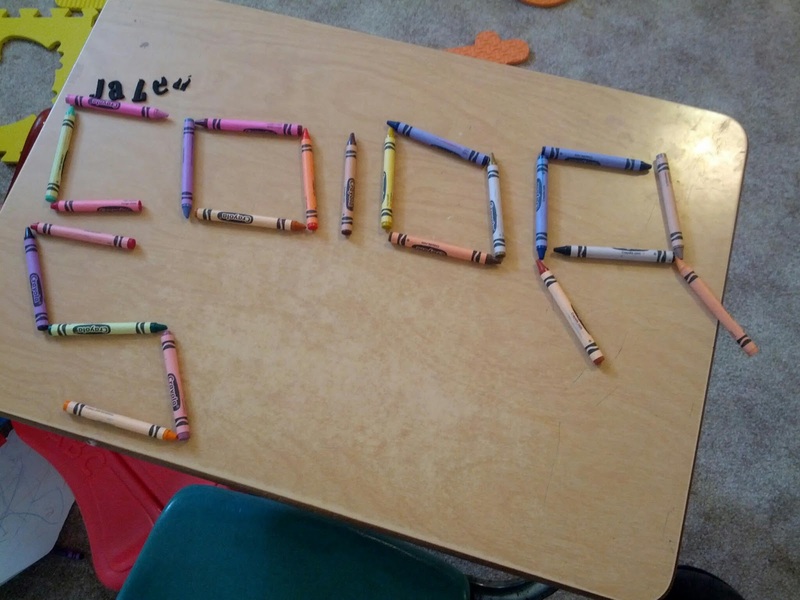 Most kids would happily color and draw using crayons. Not J. 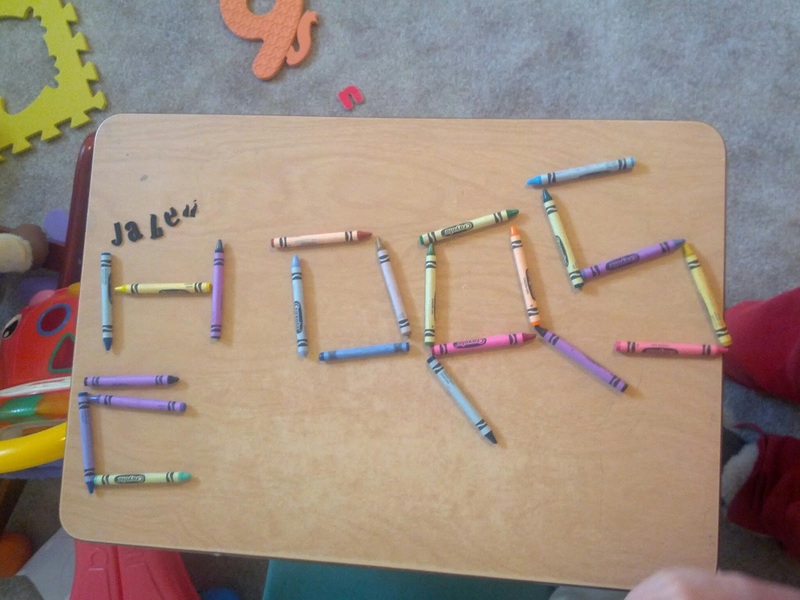 He has clearly been thinking outside the crayon box.